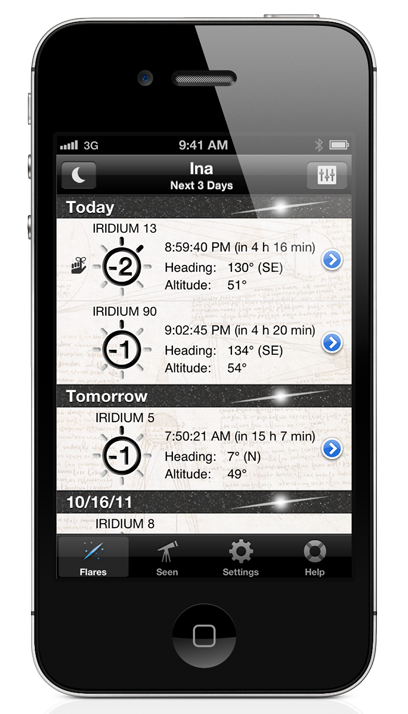 [prMac.com] Offenburg, Germany - Pleasant Software today introduces iFlares 1.0 for iOS, their Utilities app that calculates where and when Iridium flares can be viewed from any location on Earth. Iridium flares are phenomena caused by the polished antennas of the Iridium communication satellites reflecting sunlight on to the Earth below and appearing as a brief, bright "flare." The app features a visual navigation mode with night lighting option, which indicates through the camera viewer the exact compass heading, altitude, and time necessary to see the flare whose appearance the app has predicted. Iridium Communications operates the Iridium satellite constellation, consisting of 66 active satellites plus additional spares (90 in total). Unique among satellite based, worldwide voice and data communication solutions, the Iridium network covers the entire Earth, including the poles, oceans, and airways. A dependable source of light shows in the night sky, Iridium flares are viewed by stargazers and skywatchers around the world. On launch in portrait mode, the app first inquires of the user if they would like to use their present location as the basis for computing upcoming Iridium flares. Optionally, the user may input any location on Earth, directly entering latitude and longitude, or select a point on a street level Google Map. With the viewing location entered, the app takes a few seconds to compute the occurrence of any flares within the next 24 hours, next three days, next seven days, last 24 hours, or any period manually selected. The app accurately predicts to the exact second when and where flares should be visible (depending on conditions). The scrollable list of upcoming sightings includes the numerical designation of each satellite and its magnitude in the night sky (between minus eight and eight). Selecting any listing activates a slide transition that includes comprehensive information regarding that flare and that satellite. Flare details include the following: Accuracy of Prediction (the sooner the event the greater the accuracy), Date & Time, Center (distance to that point at which the satellite will be nearest and directly overhead; also viewable on a Google Map), Azimuth, Altitude, Right Ascension, Declination, Range, Magnitude, Mirror, Illumination, and Angle. Satellite details include: Epoch, Status, Launch Date, Launch Number, Launch Object, Satellite Number, Revolution at Epoch, Classification, Inclination, RA of Ascending Node, Eccentricity, and Argument of Perigee. Also available in each listing is an optional Reminder, Mail This Flare and Tweet This Flare sharing, Show Me Direction (activates camera viewer overlay), and a Last Seen entry that tracks previous sightings. The app includes a full complement of User Settings including: Reminders (1 minute before flare to 60 minutes before), Auto-Remind (reminders for flares of any set magnitude that are calculated and pending), Audio Countdown, Spare Satellites on/off, Unstable Satellites on/off, Daytime Flares on/off, and Enable GameKit (allows users to register sightings in Game Center). With GameKit enabled, the app will track which satellites have been seen, which remain, and the percentage in each category. "iFlares lets you set reminders for flares, mail information on upcoming flares to your friends, or even Twitter them (on iOS 5 devices)," commented Eberhard Rensch of Pleasant Software. "iFlares keeps a record of seen Iridium satellites on the device and synchronizes this information with Apple's Game Center. That way, your Iridium flares achievements are not only automatically synchronized between your different devices, you also can compare them with your Game Center friends." iFlares 1.0 is only $2.99 (USD) and available worldwide exclusively through the App Store in the Utilities category. Review copies are available upon request. Based in Offenburg, Germany, Pleasant Software develops applications with great focus on ease of use and gorgeous interface design. Founded in 1989 by Eberhard Rensch, some other applications from Pleasant Software are: "Birdie," a powerful and easy to use Golf scoring application for the iPhone and iPod touch. "PiP," a utility to present video from any webcam on the desktop, and "Ubercaster," the most advanced podcast production suite for the Macintosh. Copyright (C) 1989-2011 Pleasant Software. All Rights Reserved. Apple, the Apple logo, iPhone, iPod and iPad are registered trademarks of Apple Inc. in the U.S. and/or other countries.